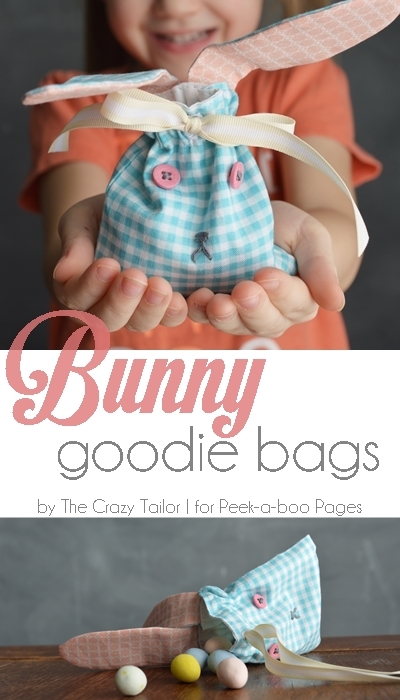 Bunny Goodie Bags - Peek-a-Boo Pages - Patterns, Fabric & More! 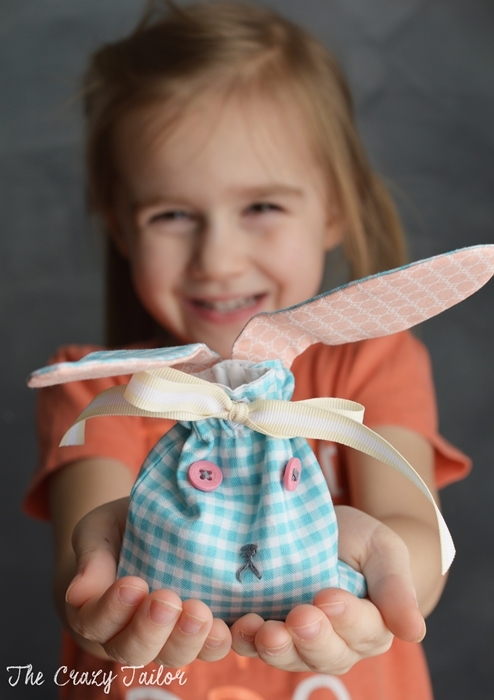 Sarah from The Crazy Tailor here with a super cute last-minute gift you can make! 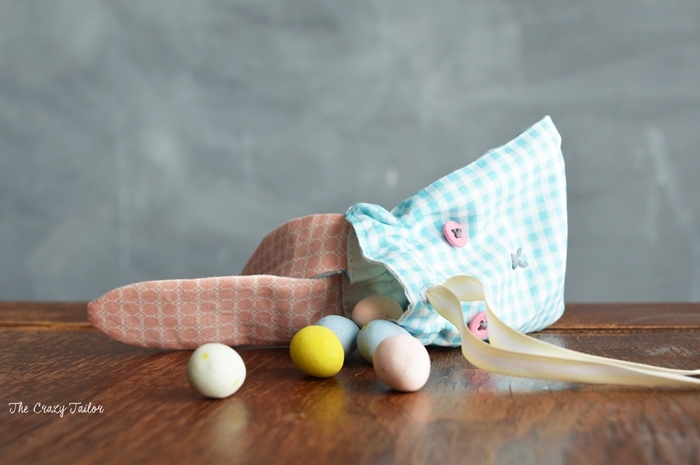 Use these to hold candy, a gift card (just make it a tad longer) or some small trinket. They go together really fast and are high on the cuteness factor!! 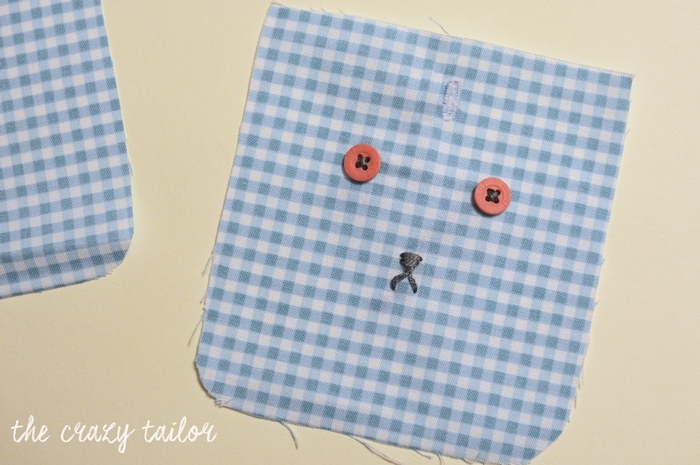 Cut out your pieces, 2 of the body in your main fabric and 2 in the lining fabric, and four ears, 2 in the main fabric and 2 in a contrasting fabric. 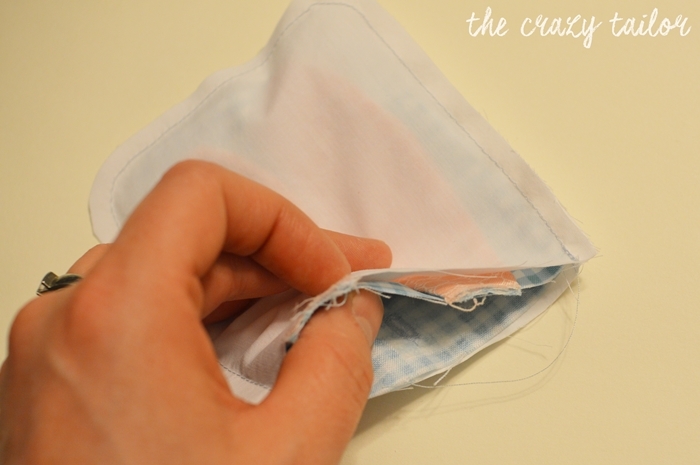 Transfer the face and buttonhole markings to the right side of one of the main fabric pieces using a fabric marker. 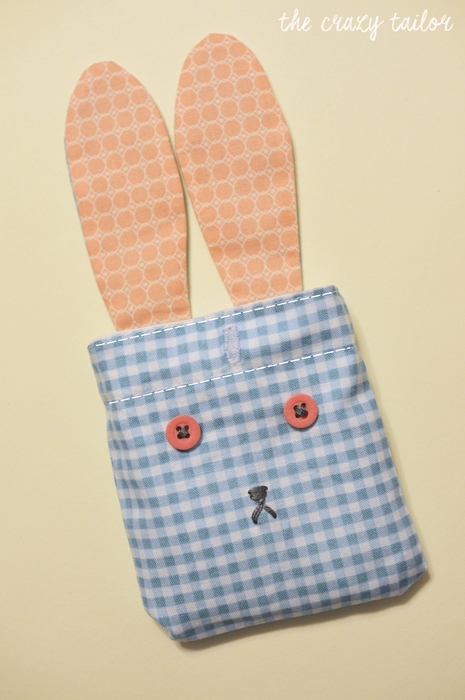 The first thing we’ll do is make the bunny face on the main fabric piece that you transferred your markings to. 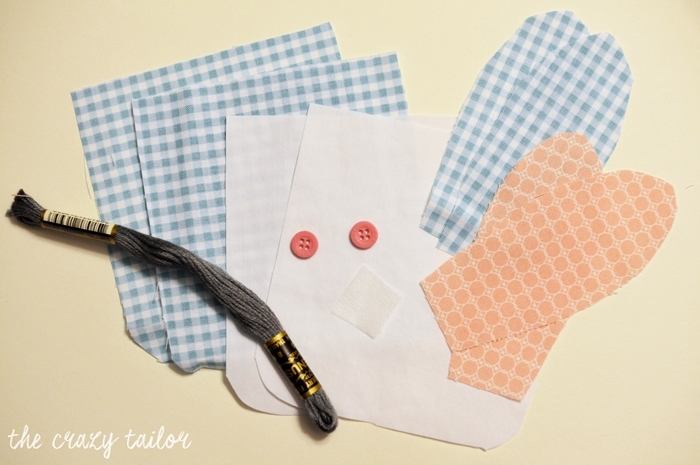 Using the diagram on your pattern piece, iron on a 3/4″ square piece of fusible interfacing on the wrong side of your fabric, directly behind the buttonhole marking. 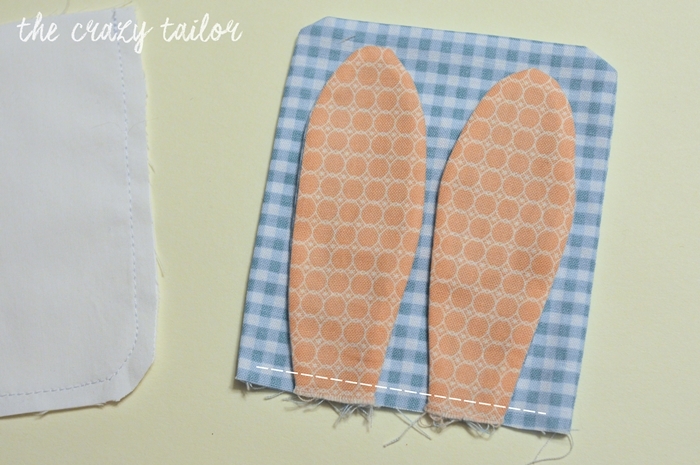 Make a buttonhole to fit a 1/2″ button. 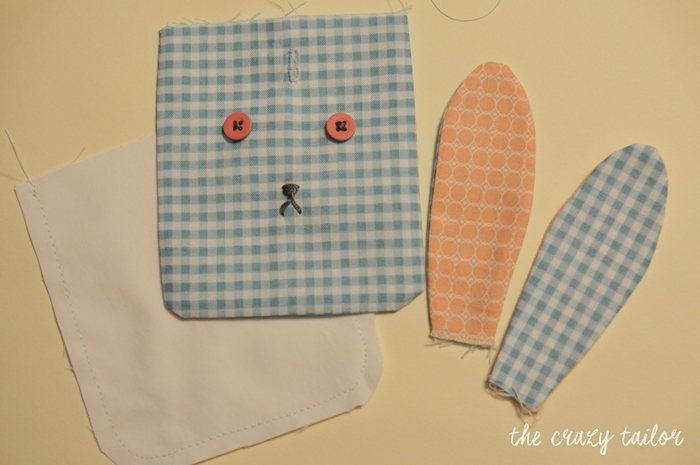 Embroider some eyes, or sew on small buttons, and make a small nose/mouth. 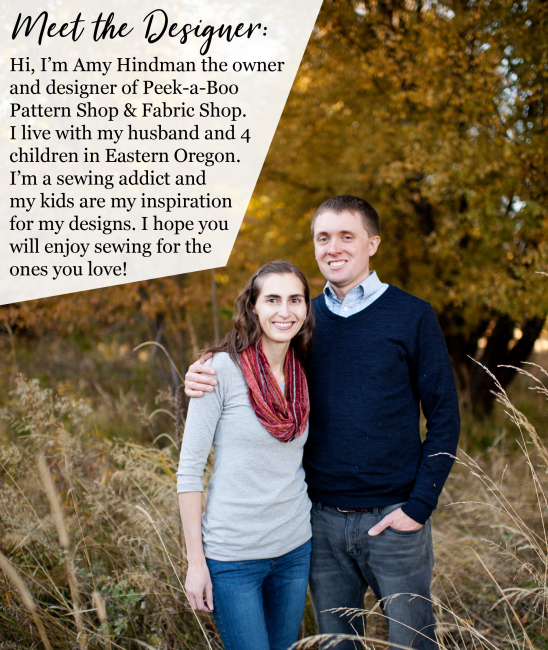 Here’s a great explanation of basic embroidery stitches. I used a satin stitch for the nose and just a long stitch for each line of the mouth. 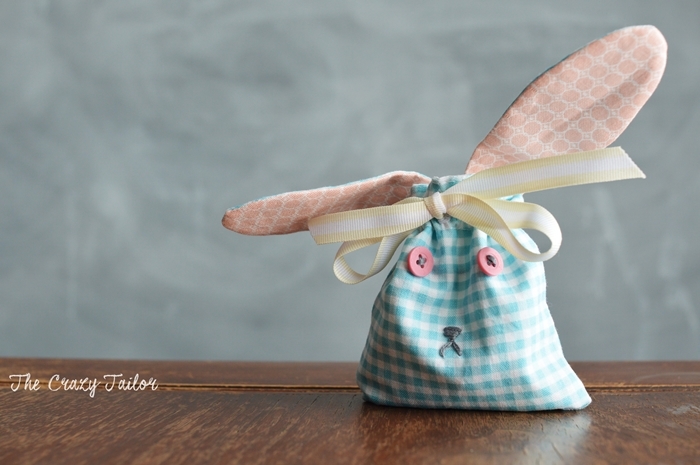 If you choose to embroider the eyes too, you could do a french knot or a satin stitch. 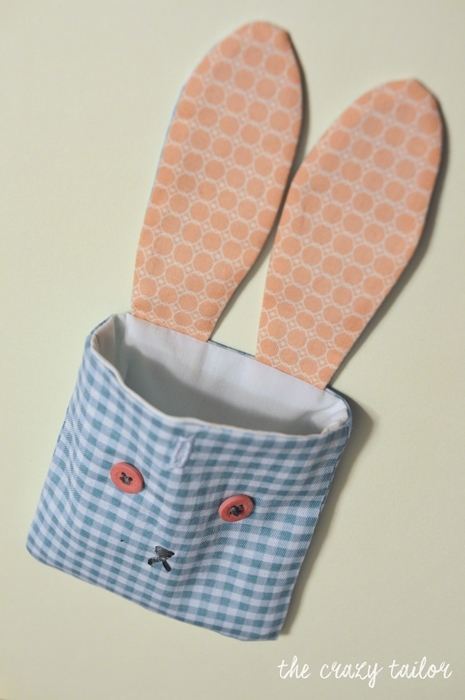 Placing right sides together, put your main fabric pieces together, lining pieces together and the ears together. Sew around three sides leaving the top edge open on both the main and lining pieces. For the ears, sew around the curve, leaving the short straight edge open. Turn right side out (except for the lining – just leave it right sides together). Now take your ears and pin them to the back of the main piece, matching the main fabrics to each other, so the lining will show in the front, as in this photo. Baste in place. Take the main piece with the ears now attached and slip it into the lining piece (that should still be wrong side out). 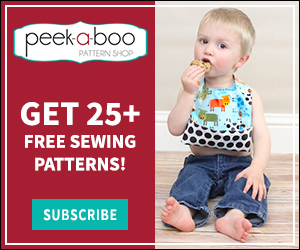 Pin and sew around the top, leaving a 1″opening for turning. I left my opening in the front. Give it a good press and then finish the top by topstitching all around – at 1/8″ from the top edge and then right below where the buttonhole ends.